On Tuesday, the Chronicle of Philantrophy released a list of the top 10 organizations that their readers said Donald Trump should donate his salary to. There were the usual suspects -- St. Jude's Children Hospital, Cystic Fibrosis Foundation and the American Civil Liberties Union -- but at No. 3 was Kruz'n for a Kure, a Muscle Shoals non-profit that was formed less than a year ago. How did Kruz'n for a Kure make the list -- and how has it reached so many people? It has everything to do with two parents who are desperate to give their kids a good, long life -- and a community that has bonded together to support two vivacious toddlers. Jessica and Kyle Davenport knew something was wrong with their son, Kruz, when he became hyper-sensitive to light. They took him to specialist after specialist for a couple of years, until they finally got an answer in June 2016, a month before his third birthday: He had Schimke Immuno-Osseous Dysplasia (SIOD), an extremely rare type of dwarfism. SIOD has dire consequences: Renal failure and a weakened immune system, along with an eventual kidney transplant. Even with the transplant, children with the disease are only expected to live 9-11 years. That's when Kyle and Jessica decided to form Kruz'n for a Kure. There is no cure for SIOD, but that has just made Jessica and Kyle more determined. Because it's such a rare disease, no one was researching cures. They were told that if they wanted a cure, they'd have to raise the money -- around $1.5 million a year-- to send to Stanford University to fund the research. So they decided that's what they'd do. Last year, the couple formed the Kruz'n for a Kure foundation -- not only to help save Kruz and Paizlee but also all the other people with SIOD across the world. "This money -- when you break it down it's life or death," Jessica says. "That's just what it comes down to. It's just a sad situation that we have to raise an insane amount of money to not only save our children but (others too.) We're connected to other families with SIOD and they need this research too. ... We pray every day for a miracle, but we know what the paper says." Kruz Davenport is a tiny 3-year-old with some big friends. Everything started at the community level. Jessica and Kyle created Facebook and Twitter pages for their organization and Kruz and Paizlee's story spread across the Shoals area. And naturally, the Northwest Alabama communities fell in love with Kruz and Paizlee -- and responded to the call for action. There's been a yard sale for the siblings. Catfish benefit. Concert. Really, there's been -- and continues to be -- every type of fundraiser imaginable. The communities have rallied around the pair in the most extraordinary way, sending emails to the Ellen show, sharing their story on social media, and telling everyone they know to support the cause. "I told Kyle the other day, 'If it was up to this community our research would already be funded,'" Jessica said. "They're dropping off their favorite toys at the house for Kruz and Paizlee, and kids are telling people to donate to Kruz and Paizlee instead of receiving presents for their birthday." And when Jessica hasn't been taking care of the toddlers or attending fundraisers or talking to the media (normally when the kids are taking a nap), she's been using social media to get the word out. She had a big break when she tweeted at the doctors from the daytime TV show "The Doctors" -- and they were struck by her story (and the video that local studio Awaken Studios had made of the two) and agreed to have Paizlee and Kruz on their show. 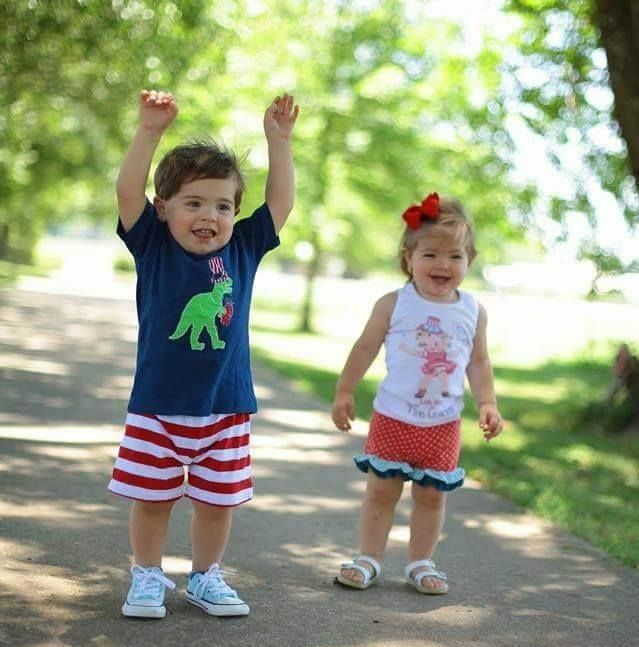 The two Alabama toddlers with rare disorder will share story on national TV. In January, the family of four flew to California to film "The Doctors" -- and the kids had a blast. "They loved the airplane," Jessica said. "They get excited about that. They'll actually watch airplanes fly over now and say, 'I've been on one!'" But January also marked a new time for Kruz'n for a Kure. With more than 10,000 Facebook fans -- and more health problems for the kids -- the board of directors told the Davenports to focus on the kids. "We have nine board members including Kyle and myself," Jessica said. "We have board meetings monthly and they're pretty much taking it on for us." With Kruz's kidney function currently at 47 percent, a kidney transplant is in the near future. So Kyle and Jessica can spend more time with the kids, an administrative assistant handles their fundraising schedule, and another person controls the organization's Facebook page. But Jessica still handles the interviews -- and she's getting plenty of interview requests. How did they make their way onto the list? Jessica simply shared the link to vote on her Facebook page. That's it. People who follow her voted and shared to their friends, and well, that's it. And she definitely, definitely wants Donald Trump to donate his salary to her cause -- but she's not the one to convince him. "I would let Kruz and Paizlee do the talking," she laughed. "All it would take is meeting Kruz and Paizlee and just being around inspiring two and three-year-olds who live life to the fullest and have no idea that something is wrong. They're amazing kids and they teach us adults lessons every day about enjoying life and so I think if they ever meet Donald Trump we wouldn't have to say a word." Even though Kruz'n for a Kure has reached more people than they imagined, it's still not enough. The Davenports have sent $250,000 to Stanford University since November and they're about to send $50,000 more, but they still need more. They're urging people to participate in their #4KforaCure pledge, which states that if 4,000 pledge to donate $25 each month for a year, they'll get $1.2 million a year. But no matter how much money they need, they're just devoted to giving Kruz and Paizlee the best life possible. "Any day you can wake up and not have a good day and let this completely consume you," Jessica said. "Kruz is aware that he goes to the doctors and he gets shots, and he's questioned why. But as far as him and Paizlee, this is life and this is their normal and we have to try to make their lives as normal as possible. The only thing we want to see is them happy."